90Million Blog's 1 Year Anniversary! As this month draws to a close I am amazed and proud to announce that 90Million Blog has been online for 1 year now. It has gone from being a blog with less than 5 posts a month in the first few months to one which I am pretty dedicated to updating every workday. The readership of this blog has also increased beyond all my expectations. A big thank you to those that read this blog and add comments as well - I really appreciate it and hope that this provides a service that you find useful and occasionally entertaining. Investing in real estate posts: I will continue to post real estate related posts on a weekly basis. Getting into Investment Banking: I will continue my Investment Banking series which I hope to be a practical look at the industry and a useful resource for people considering working in it. If you have any other suggestions I would love to hear them as I always trying to improve what I post. The Adventure Capitalist is a fun and entertaining read that takes us back to the basics of trade. You will not find any mention in this book of housing markets, stock markets and Wall Street. Instead Connor Woodman attempts to answer the question: can an individual get out there and start trading in goods in the international marketplace and make a decent profit? The reader rides the highs and lows with author as he seeks to answer this central question. Through the author’s adventures the reader discovers the answers to many more questions including: Is it possible to buy camels in Sudan and then take them to Egypt and sell for a profit? Can you really buy wine in South Africa and then ship it to China or is the market too young (and snobbish)? And will tourists in Mexico buy inflatable surfboards made in China? This book will not provide you with the knowledge to get out there and start making money, nor does it have any ‘special formula’ for success and we found that to be the books greatest strength. We, the reader, discover that there is no great secret to the business of international trade – you need to do your research and more importantly just get out there and make your mark on the world. Insurance: How does the medicare levy surcharge work? A quick pre-tax time tip re health insurance. Every single year before June 30 health insurers go on an advertising binge telling prospective customers to 'get in before June 30'. This is aimed at those who, because they earn above a certain limit and do not have private health insurance, are charged the medicare levy surcharge. However please note that the surcharge you pay is based on the number of days covered by health insurance during the year. Getting health insurance right before June 30 does not eliminate your obligation to pay the surcharge for the rest of the year. So there is no real incentive to take up health insurance before the end of the financial year but there is definetely incentive to take it up quickly. Further the intoduction of a tiered surcharge system means that all middle and high income earners should look very seriously at what health insurance would best suit them. Background - how does the Medicare Levy Surcharge work? In the 2012 / 2013 year there has been a change to the way in which the MLS is calculated including a significant increase in the MLS if you do not have private health insurance. There was also the introduction of a tiered system - Below I have outlined the new MLS thresholds and surcharges. This post is part of both my Investing in Real Estate series and my series on tax measures in the run up to the end of the financial year. All investors in real estate in Australia should get a depreciation report done on their investment property before the end of the financial year end. You do not need to spend money for a depreciation report and you can estimate the value of the depreciable items yourself however if you are audited and the ATO sees that you have done this they are more likely to investigate the values you are claiming. The best way to get an accurate estimate of the values (and not to miss anything!) is to use a good Quantity Surveyor. Quantity Surveyors are not abhorrently expensive (should be in the region of ~$700) and generally pay for themselves in the first year Note that this amount is tax deductible so you're actual out of pocket cost is more like ~$500). I used depreciator.com.au which was recommended to me by several other property investors. I found them to be highly professional the report they produced was perfect (and my accountant was very happy with it. I have heard bad things from other (cheaper) providers of this service so I would recommend going with these guys. If you mention that you heard about them from the somersoft website (a property forum for Australian investors) then they should give you some sort of discount (I got a $55 discount when I did this). If enough people mention this site in addition (i.e. don't lose your discount) I will try and negotiate a standardised discount for my readers. How much will I get back from a depreciation report? To give you an example my property is a relatively old one (built in the mid 1970s) but has a renovated kitchen / bathroom etc. In my first year of ownership I claimed a $4,000 deduction and got $1,600 back as a result. Some older properties will not get this much back because they have had very little done to them since they were built. If you call depreciator they will be able to tell you whether it is worth getting a report or not. They are fairly honest about it too as they trade largely on their reputation. What is the difference between the diminishing value method and the prime cost method? You will notice on your depreciation report that you have the choice to deduct tax based on a diminishing cost method or prime cost method. Over the long term these will yield the same amount back on tax but it affects the timing of the deductions. The diminishing cost method provides a greater deduction up front (close to twice as much) compared with the prime cost method. Over the life of the investment it makes little or no difference. I use the diminishing cost method because I do not foresee my income tax bracket changing and I would rather have the cash now than later. Developers are more than aware that there is a tax incentive to buying a new property for your investment as you get greater amounts of depreciation. This value is almost always built into the property when they know they are selling to investors. I generally do not buy new properties or properties off the plan for this reason. The developers know every possible advantage from a tax perspective and build this into the price of the property so that they get the benefit. Tax time - Should I repay my HELP debt early? In Australia, we are lucky enough to have a system where everyone can afford a higher education. The government will fund undergraduate education for every Australian resident under the Higher Education Loan Programme. This repayment rate is compulsory. The question arises of when should you repay your HELP debt early? At first glance there seems little incentive to repay your HELP debt early. The implied interest rate (inflation) is the cheapest debt you will ever get so you should really use your cash for other things (which you would normally borrow money for) such as investing or buying a house etc. However the programme incentivises you to repay your debt early by providing discounts for early repayment. After 31 December 2011 this incentive dropped to 5% for all amounts paid above $500. Note that the above example only works in the year where you are due to finish repaying your HELP debt. In other years your contribution will just further reduce your HELP balance and you will only get a 7.5% annualised return. Rich Dad Poor Dad is a book by Robert Kiyosaki that attempts to teach the reader the strategies learned from his ‘rich dad’ on his journey to riches. On the front cover of the book he makes a big promise – he promises to teach the reader “What the rich teach their kids about money – that the poor and middle class do not”. For a book that had reached the number 1 position on the NY Times Bestseller list, I found that this book did not achieve what it set out to do and there were very few (if any) strategies or lessons that the reader could take away from reading the book. I would rate this book 0.5 / 5.0. Normally when I summarise a book at the start of my review I try and identify the overarching theme of the author and then bullet the supporting topics they use to discuss this. I found this exceptionally hard to do with Rich Dad Poor Dad. The general idea throughout the book seems to be that it’s not the readers’ fault that they are not rich – the government, employers and bad education system are all biased against them. I started writing specific examples of what I thought this book did wrong but then I kept finding more so instead I have summarised the thing that I found most distasteful about this book. Instead of dealing with facts, figures, strategies, studies and investment techniques (as any book on investing should), Kiyosaki preys on the readers inherent biases and misconceptions (that the government, employers and a lack of education is the reason they can’t get ahead). While this rhetoric is certainly appealing it is not what a book about investing and personal finance should contain. In the lead up to the end of the financial year I am doing a series of posts on last minute things you can do to reduce your tax. This post will also tie in with the superannuation series I have been writing over the past few weeks. In previous posts I have mentioned that under Australian law your employer has to contribute 9% of your total wage (including bonuses etc) into superannuation for your retirement. The government also incentives you through tax breaks to contribute more. If you earn more than $37,000 before tax you can reduce the tax you pay through contributions to superannuation. However you should remember that if you contribute this amount then you will not be able to touch it until you retire. It is important to remember the above because tax should not drive your investment decisions but should be part of the decision making process. You may have heard the term 'concessional contribution' quite often though asked the question 'what is a concessional contribution?' or 'how do concessional contributions work?'. The concessional contribution is the amount of money that you can put into super in a given year that is taxed at the 'concessional' rate of 15%. In 2011 / 2012 this is $25,000 if you're under 50 and $50,000 if you're over 50. Note that this includes the amount that your employer is contributing to your superannuation as well as any benefits they pay for you through super (e.g. life insurance). If you earn $100,000 (pre-tax) you're employer has to contribute $9,000 towards your super. This means than you can contribute an extra $16,000 (pre-tax). If you earn more than this (or are over 50) the potential benefits are even better! Always keep in mind though that this money is not available to you until you retire. This is once again a post for Australian taxpayers. If you are an Australian taxpayer you would have received a letter in the mail which outlines the changes to the health insurance regime. It is possible to still receive the 30% health insurance rebate for the 2012 / 2013 tax year if you pay the premium by 30 June 2012. I would normally have to do a time value of money calculation to work out whether this would put me ahead however given that I am standing to lose the full rebate there is no way known I could make a 30% return in a year. If you were only standing to lose 10% of the rebate (Tier 1) then this would be a borderline decision. Tier 2 and above should almost always prepay and get the rebate. These problems tend to typically arise where a person has worked hard and pulled themselves up and done better than their peers or their family in a monetary sense. In Australia we typically call the problem the 'tall poppy syndrome' where people like to pull those who are doing well down to their own level. The fact is that this is not an easy problem to overcome and people deal with it in different ways. A common thing I see posted on message boards is that you 'should not associate with people who are bringing you down'. I think this is a simplistic solution. I do not know many people who associate with their family and friends just to push themselves up. We associate with them because we like / love them for who they are and how they have treated us. I am aware of how each person is likely to react and treat them accordingly. There are friends of mine that are doing as well and even much better than I am and there are those that come from very wealthy families. I am a lot less guarded around them and we are the ones who discuss investment techniques and strategies as we are comfortable with each other and know that we are not going to get jealous. Again this is such a personal topic but I know it creates so much havoc among friends and family. I find that keeping finances personal is an old tradition that works well for keeping friendships and families whole. I should preempt a natural question and although this may seem a strange topic for me to cover given the nature of this blog and the amount of detail I post (including my expenditure reviews from which you can gain a rough estimate of how much I earn and my net worth posts) I have never told anyone I know that I write this blog and I am fairly careful to ensure that my personal details are not on this blog. This is just a quick post from me for Australian readers about the Woolworths Everyday Rewards card and the surprising savings that are available by using it. For those who are not familiar with it the Woolworths Everyday Rewards Card is a free card which allows you to link your Qantas Frequent Flyer programme to your grocery shopping as well as well as store your 'fuel credits' on a card (i.e. you do not need to keep several dockets and work out which ones to use every time you want to get discounted petrol). What I didn't realise was that you could also get significant savings in store by using the card. Until the 26th of June there are a range of products which are up to 20% cheaper if you have and use the card. There is no restriction on the quantum of the relevant product that the discount applies to either. Woolworths have said that they may continue this sort of promotion into the future with a different range of products so even if you apply for the card but do not get it until after the 26th of June, 2012 it is still worth holding onto. It is also worth keeping track of the different promotions that get done on the card. I had originally signed up for the card because it came with a free Qantas Freqeuent Flyer membership (normally ~$80). The promotions they offer are very good. Given the card is free with none of the hidden catches that we have become so wary of (I have had the card for ~3 years and have never been charged a fee) and that you can get significant savings on your grocery expenditure I think it's definitely worth signing up for. ‘Pitch Anything’ by Olen Klaff is a book which has a big claim on the front cover: “An Innovative Method for Presenting, Persuading and Winning the Deal”. I’m a big fan of books that clearly set out what they intend to cover in the book and then spend the whole book covering it and this book is one of those - I would rate this book 4.5 / 5.0. The greatest strength of this book is that it gets right the balance of providing background, instructions, examples and evidence of how the different techniques work. It is worth a read for the reader who is looking for a different technique to pitch or simply for those looking to be more effective in their commercial dealings. This is my third post in my superannuation series and will cover the benefits of consolidating your superannuation accounts. For those who want an overview of the superannuation system in Australia I have posted on this before as well as the main types of superannuation funds. Superannuation is typically a 'set and forget' type of investment program. From a psychology point of view it is probably the best type of investment system because it gets taken out of your wage every month before you have seen it, invested in the same range of asset classes regardless of the prices (i.e. dollar cost averaging) and very few workers actually bother to check the superannuation portfolio until they get closer to retirement which means that the psychological aspects of investing do not impact decision making. For all these 'positives' the major negative is apathy. Because it is compulsory by law, most employees barely even think about which superannuation account their money is being paid into. For those that change jobs (like myself) you may end up with multiple superannuation accounts because employers use different funds. I have been working for less than 10 years and already have 4 superannuation accounts with 3 different funds. Once you have all your money in one account you can split it among the different investment classes as you see fit. Further you will not be paying excess fees and will not be over insured and paying premiums on multiple insurance policies that cover the same risk. This is my twelfth post in my Investing in Real Estate series which will cover the basic things you should do before leasing your property. No property is ever going to be in perfect condition when you buy it and the pressing question for a lot of first time landlords is how much should I do (and more importantly what can wait)? Broadly speaking, repairs and maintenance falls into three categories - the essentials, the things you really should do before you try and lease your property and the things that can wait and I'll cover each of these below. Complying with all relevant legislation. For example, in Australia all rental properties need to be fitted with working smoke alarms. Clean / mow the garden and get rid of weeds: Your front yard is the first thing your prospective tenants will see and the back yard is where they will imagine spending time with their family and friends. It doesn't need to be landscaped - just neat! My property's yard was overgrown and there were weeds growing through the brickwork at the back and it looked pretty bad. I paid a gardener $100 and he fixed it in a day! For rooms that do not have walk in robes - buy some decent cheap cupboards: This one was a piece of advice given to me by another property investor which I used! Everyone needs robes in their house and not all tenants have their own. A lot of houses have built in wardrobes in every room but not all (one of the rooms in my house didn't). The easiest way is to go down to the local second hand store and pick one up - they are relatively cheap and are a tax deductible expense. All of the above items are relatively cheap (or free if you are willing to do it yourself) and make your property that much easier to rent. There is a danger in doing too much before you lease because for a given area there is only so much that people are willing to pay before they think they can go to a better area so your rental rate is always going to be capped. Also in some jurisdictions (e.g. Australia) there are tax consequences of doing 'improvements' before the property is leased. Repairs and maintenance are considered expenses but improvements are added to the capital value of the house which is a negative from a tax point of view. Things that are done before the property is leased are generally considered improvements. Non core structural issues: This includes things like cracks in the wall. Every property gets cracks in its walls and it is not often a big problem. If you wait for a few years it can be classified 'maintenance' and you can get a tax deduction for it. There are lots of other things that fall within this category. The important thing is not to spend too much money and overcapitalise your property. This is still an investment and you need to make your return. At the same time you never want to be a 'slum lord' and rent out a property that is terrible and unlivable. Always weigh your tenants needs and desires and your property will always be in demand. This blog has forced me to think about the amount of money that I have spent in a way that I have rarely done before. I am now concentrating on getting the same products for much cheaper prices. What this necessarily means is buying some things in bulk. An example of this (as mentioned in my May 2012 expenditure review) was the ammunition I bought in bulk for my hobby of target shooting. Discount buying is a common way of saving money and everyone does it - the number of bulk buying discount stores is testament to this fact. What I never really thought about though was the fact that in bulk buying we are making a conscious trade off between spending an extra amount now to lower the unit cost of the product that we want however this naturally means that we are outlaying more currently. Again this would be no great revelation to everyone but the thing I came to realise is that we deal with this opportunity costs in almost every area of our lives and never really think about the fact that this is what we are doing. In economics terms an 'opportunity cost' is the value of the next best alternative that we are giving up. This does not need to purely relate to price. For example the opportunity cost of me going on a date with a girl is a night out with the boys or a night watching some movies at home. Obviously there is some financial cost to all of these outcomes but there is also a 'hidden cost' and that is utility or 'happiness'. There are some decisions which we can always come down with one particular answer. There are others though were we may hum and haw for a while. This blog has actually started to influence how I make some decisions. Realising that you are dealing with opportunity costs can actually make conflicting outcomes (such as the one above) a little easier. You can prioritise what the most important factor is to you (for me the more I thought about it the more I realised the point of this blog is about financial freedom so a lower cost is preferred) so I ended up buying a larger amount to save the money instead of the smaller amount which would have made the blog post look better. You may point out that this is actually over thinking what is quite a simple decision but when I came to the realisation that I could apply this decision making process to almost any aspect of my life it was quite liberating. Asking the question what is the next best option always helps makes decisions easier and I'm not sure that this is done enough. I apologise if this post ended up somewhat 'preachy' and this was not my intention. It just added another limb to my decision making process (and was one of the few limbs that made a decision easier) so I was keen to share it. Anyway let me know what you think. If you think I'm completely off the mark I would be keen to hear about that too! The Essential Buffett is a book which attempts to simplify and explain the life, teachings, investment philosophy of Warren Buffett – the world’s richest investor. The book is a cross between a Warren Buffett biography and a ‘how to’ book on focus investing. I would rate this book 3 / 5. Writing a book (especially one less than 300 pages) that covers all these topics adequately was always going to be a challenge for any author and while Hagstrom does a reasonable job in ‘The Essential Buffett’ the reader is left feeling that there is a lot more reading that they need to do before they are able to apply any of what Buffett does. This book is suited to those who are beginning their investment journey and are seeking an investment framework that works for them. It covers a lot of in depth concepts at a very high level – those who have already embraced the concept of Focus investing are best placed to look elsewhere for more detailed books on methodology. The core lesson from this book is that investing should be able core value – are you getting a good deal (and not paying too much) for what the underlying business really is? The author provides very strong (albeit unintended from his point of view) evidence for this. The book was written prior to the tech bubble bursting in the early 2000s and it attempts to provide a value investing analogy to invest in technology stocks. In hindsight we see that the principals of value investing hold true in all sorts of markets while attempting to extend the philosophy to new concepts and ‘fads’ without proven earnings rarely yields the same returns. What is the difference between Industry super funds and other types of superannuation funds? This is my second post on superannuation funds and will attempt to briefly describe the different categories of superannuation funds. For an overview of how the superannuation system works in Australia see my previous post on this topic. Broadly there are 4 types of super funds - Retail Funds, Industry Funds, Employer Funds and Self Managed Super Funds. Below I will outline the main differences between the funds. It should be noted that for all the externally managed funds (i.e. all except the SMSF's) there are external fund managers used so differences mainly come down to fees as performances tend to be very similar. Also previous performance for super funds especially is no indication of future returns so looking at performance history is a silly thing to do. In a previous post I outlined those areas which investors should probably avoid due to the uncertainty in the European investing environment. In this post I will outline some areas where investors may find opportunities to get great value investments. In my opinion the safest way to make good investment returns in Europe in the current prevailing environment is not to try and predict the way the markets will go or what business sectors will recover etc but rather to invest in those areas which are already fundamentally sound but which are being hit due to the general malaise in Europe. It is the perfect buying environment for people who do not get emotionally involved in their investments because you can take advantage of terrible market sentiment to make great profits. Not living in Europe is also a big advantage as you are removed from constant negative news flow etc and can focus purely on your companies and investments. Companies listed in Europe which have no operations in Europe: There are several Asian companies that listed in Europe over the last few years (presumably to get international exposure) which have no operations in Europe. These companies are exposed to the highest growth economies in the world, have absolutely no exposure to Europe in a business sense but their share prices have been smashed along with the rest of the European share market. Small Cap stocks in Europe that are performing fundamentally well: In a 'risk off' environment like the one that currently prevails in Europe people only want to own the biggest 'blue chip' stocks and will not touch small caps with a ten foot pole because of their perceived riskiness regardless of how the business is doing. As long as these businesses do not need to tap the funding markets they are a great place to find bargain investments. Companies listed and operating in 'strong' European countries like Germany: The big uncertainty with Europe is whether the EU will stay together or whether countries like Greece, Spain, Portugal etc will leave the Euro. The uncertainty is causing the Euro to remain depressed and is affecting companies and stocks in almost every market in Europe. Countries like Germany are actually performing extremely well. As soon as certainty returns to the market (regardless of the outcome) these stocks should perform well. Even if the Euro collapses and Germany goes back to the Deutschmark this will be a much stronger currency than the Euro currently is (as the Euro is dragged down by the poorly performing countries) so as an investor you win either way. One thing that should be noted with investments like this is that they will not come off straight away or even within one or two years. As an investor you are waiting for the market to settle down and for investors to 'realise' that these companies that they have been shunning are actually really good investments which drive the price up. You are waiting for market sentiment to return to normal (the business does not need to improve for you to get your return although this may provide an extra kicker). Occasionally you can find stocks which conform to all the above criteria. An example is Kinghero AG which is a stock I'm invested in - it is a small cap, German listed clothing manufacturer and retailer which only operates in China. There are plenty of others out there - all you have to do is look for them. Disclaimer: I'm long Kinghero AG. Also make sure you do your own research and get advice relatign to your pesonal situation. This is not meant to be investment advice and investors should do their own evaluations of opportunities and stocks. May 2012 saw a large reallocation of funds from my Home Loan offset account (effectively investments in fixed interest securities) to the share market to take advantage of the very low valuations that the market was showing. It was also marked by a significant decrease on my personal expenditure compared to previous months however I still could not keep this within my target range. Over the last few months I have had large swings in and out of my share investment accounts (including my large proposed investment in the share purchase plan which was scaled back ~99%). However the amounts I have invested this month are relatively long term value investments which I do not expect to exit in the near term. They were to take account of the significant weakness in the share market seen in May. 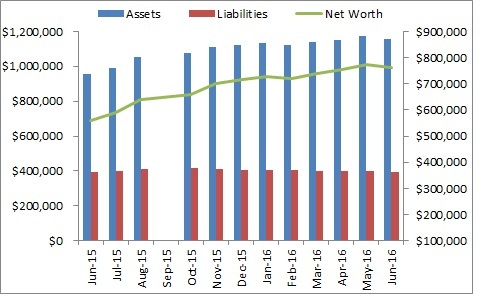 On a cumulative basis only my share investments are in positive territory while I have actually taken money out of my home loan offset account compared with the start of the year. This is a position that I am comfortable being in as I am very overweight property at the moment. My aim is to have a relatively balanced portfolio. My focus over the next few months will be on evening my net exposures first (i.e. increasing the amounts held in my home loan offset accounts) and will then look at my gross exposures. Looking back at my predictions from my April 2012 net worth post most of the things I had predicted came to fruition. It was just disappointing that despite the level of discipline I was able to show this month the increase in net worth was relatively minor. One of the big things I need to work out how to do is to accelerate the growth in my net worth. There is only so much you can do saving (for me saving ~3,000 to $4,500 per month from my wage is about was good as I can do) so I need to work out a way to generate other income. I have mentioned before that I would like to start a small business to generate some side income however thus far no ideas worth pursuing have come to mind. My prediction for June are much the same as May. Increases to my net worth will be driven by the share market and my ability to control expenditure. As June represents the end of the financial year and tax year in Australia for individuals I may also have some changes in my net worth related to tax planning. June will also represent 12 months since I first posted my net worth so I will do an annual summary of my performance.